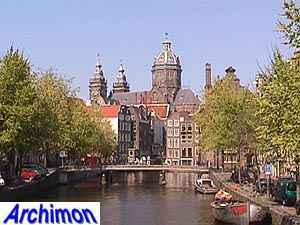 In 1578 the Amsterdam city counsil in a moment of opportunism formally declared the city a protestant one. In the city, which until shortly before that moment was loyal to Spain, the catholics were now officially forbidden to hold religious services. All churches and chapels were handed over to the protestants or given a new profane function. 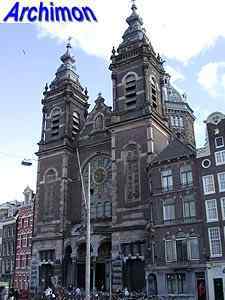 The parish of the old St. Nicolaaskerk, renamed Oude Kerk ('Old Church') by the protestants, continued to gather in secret in the attic of a house, a hidden church aptly named Ons' Lieve Heer op Solder ('Our Lord in the Attic'), although it still had St. Nicolaas as its patron saint. This hidden church was not replaced until 1887, 92 years after catholics were officially no longer second-class citizens. 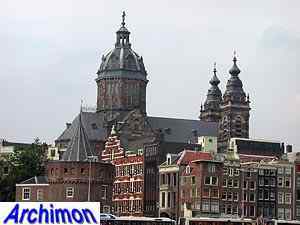 Several new catholic churches had already been built elsewhere in Amsterdam. 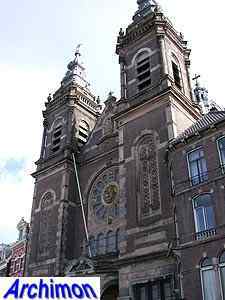 At the time the new St. Nicolaas was built neo-Gothicism has been the more or less official catholic architectural style for over three decades. But architect Bleijs, a former employee of P.J.H. 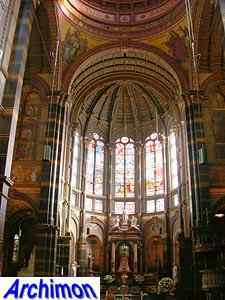 Cuypers (who had fired him over some disagreement), chose a combination of neo-Renaissance and Baroque influences instead. A remarkable choice, as neo-Renaissance was essentially the protestant answer to neo-Gothicism. 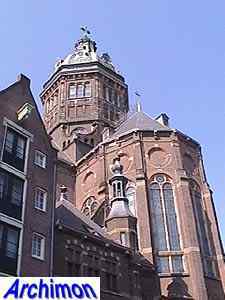 Bleijs built another church in a similar style in Hoorn, as well as several in neo-Romanesque and neo-Gothic styles. The official name of the St. Nicolaas is St. Nicolaas binnen de Veste ('St. Nicolas inside the Walls'), referring to its location within Amsterdam's original borders. Its groundplan is that of a fairly conventional three-aisled cruciform basilican church. 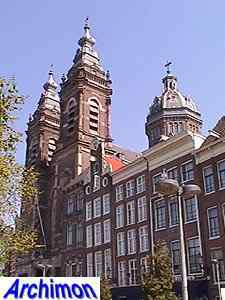 At the front are two towers with Baroque-style spires. 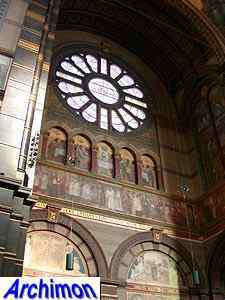 The facade in between the towers has a large rose window in between, in the centre of which is a bas relief depicting Jesus and the four Evangelists. The transept has polygonal closures on both sides. On the crossing is a large octagonal tower crowned with a Baroque dome, on the top of which is a lantern-tower. The original inner side of the dome, with its stained glass windows, was removed at one time and the windows closed, blocking the light fom outside. 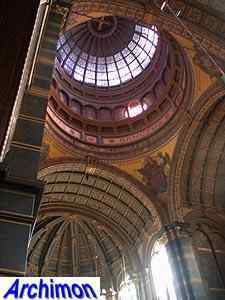 Plans for a future restoration of the dome should restore this part of the church to its former glory.